One of the first cartoons I watched. A man in black clothing (like red outlining) throws three rock cubes, with red writings on them, and a gigantic metal/rock monster appears. Maybe he gets his arm taken off and replaced with a blue metallic one. I think you may be talking about Di-Gata Defender. You can read more about it - including a brief plot summary - in the linked Wikipedia article. characters fight using cube-shaped rock-like rune dices, covered with weird symbol. While not every spell cast using the runes is a summon spell, it is indeed possible to use the dices to summon "guardian entities". The rock monster you remember may have been Kragus, the guardian commonly used by the main character of the show. 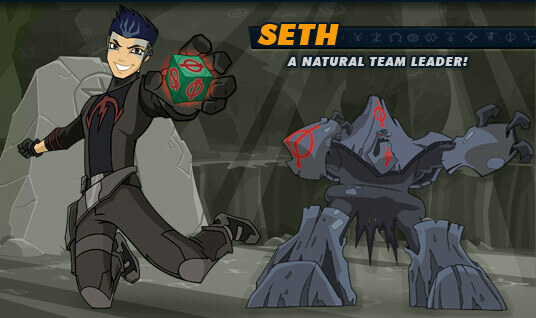 speaking of the main character, Seth - he indeed wear black clothes. The clothes are decorated with some red writing, again matching you description. later in the show, Seth loses his right hand and has it replaced by an artificial one. This is actually a major plot device in the story. What is the name of a scorpion monster movie that is not “The Black Scorpion”?